Where I live in Canada, snow covers the ground all winter and spring is the first time we see the earth for six months. When the snow melts, it’s a great time for pet sitters to remember to take stock in safety measures for themselves and the dogs they’re with, too. 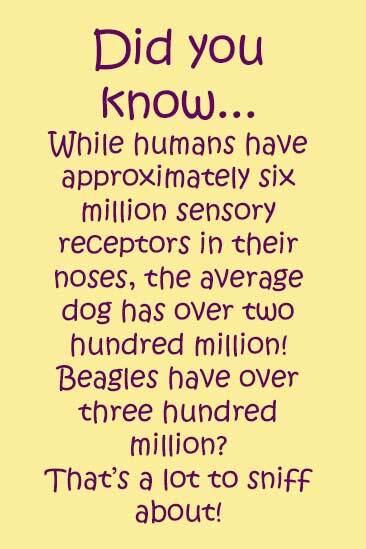 Dogs LOVE springtime and it’s hard to keep their noses from the ground with all the delicious aromas out there, but be aware! The smells aren’t all good and what’s left from beneath the snow can make your dog sick! Do you live in a warm climate? By the water? Not everyone experiences a sharp change in seasons as we do, but pet sitters everywhere know the potential for problems pop up without warning. Ocean tides, lake debris, desert heat, and torrential rain storms bring their own set of tantalizing smells for pups. Plus – dogs have a natural gift for unearthing exactly the wrong thing to sniff or chew. Culverts large and small – Animals often hide in there. If they feel threatened by an inquisitive dog snout sniffing about…they will attack. Aside from causing a nasty wound and leaving bacteria behind, depending on where you live, the animal could be carrying a disease such as rabies. 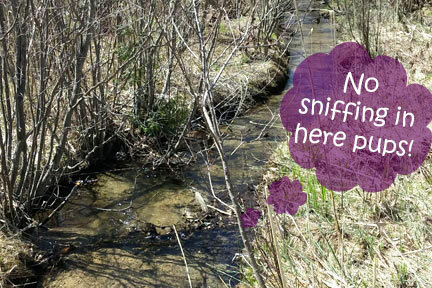 Ditches – I can’t think of a dog I’ve known who wasn’t attracted to the sweet smell of new grass shoots. And what better place to find them than in a ditch…where the first ones of the season always seem to grow! But there’s also stagnant water in there, rotting plants, and awakening swamp life in the spring sun. The lawn grass will grow everywhere soon to provide a delicious safe buffet…keep the dogs well away from ditches for now! Shorelines – What better place to run or stroll with your best pal than along the edge of the river, lake, or ocean at any time of year. Watch for anything that might attract the eye or nose of your dog…or alternately cause harm such as broken glass or jellyfish. Old barns or woodpiles – Barn cats, bats, rats, poisonous spiders and other animals make their homes in run-down barns and sheds. Fallen wood planks with exposed nails are often found on the floor, partially covered by dirt or straw. Rusted wire, ropes, and rotted floors are also a danger. Keep your dog by your side and away from exploring where he doesn’t belong! Dead animals (mice, birds, rabbits, raccoons, fish…). No need to explain why! Newborn animals with wary mamas! – Don’t be fooled by size. A chickadee making a home for her brood in our backyard one year decided that our dogs were just too close for comfort and the parent birds continually dove at the dogs’ faces whenever they ventured to that side of the lawn. Birds rustling around in the low brush looking for just the right dried leaf or twig for their nests can make quite a racket and attract the attention of your dog. It’s unlikely the pup will actually make contact with a foraging bird…but if he spots it before you do (always the case) you might find your arm wrenched half out of its socket when he makes a run for it! Syringes and needles…sorry…but they’re out there. Plus other unmentionables we don’t want our dogs to step on or ingest. Beautiful sweet smelling shoots from grasses, wild flowers, weeds, and early spring flowers – Although a little grass won’t do a bit of harm in most cases, many wildflowers and garden flowers have the potential to seriously poison your dog. Don’t take it for granted that dogs come with a danger meter that stops them from eating the wrong plant. Winter road salt – (it’s not table salt!) and other corrosive road treatments wash into the ditches and roadside greenery and dry into the dirt. Anything the dog eats or smells on this earth (including licking his paws after the walk) means he’s ingesting the salt-chemical cocktail. Be careful, especially along well-used highways where a lot of road salt has been used. Rinsing the paws, even well after the winter season has passed, is still a great idea. Last year’s (and fresh) poops are crowd-pleasers – Most dogs like to take a sniff to see who’s been by even if it happened just prior to the first snowfall. For most dogs, sniffing is the extent of it – but as a pet sitter you need to be aware that the cute little puffball you’ve come to know and love might enjoy a little poop snack now and then. Some only enjoy the winter poopsicles but others are year-round snackers. If your head is in the clouds during your walks, you could be putting your dog – and yourself – in danger of illness or a nasty encounter. We have to keep our eyes watching a few steps ahead of the dog at any time of the year. It’s why your client hired you…as a professional and not just the kid down the street…after all!